I have seen tons of really great back to school activities and, although I am no where near ready to go back, just like the rest of you, I am beginning to plan. I love to start the year off making class books because my students love to read their own work over and over again. 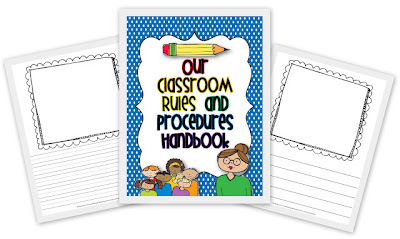 I already blogged about my Classroom Rules and Procedures Class Book. You can find that little freebie by clicking on the image below. 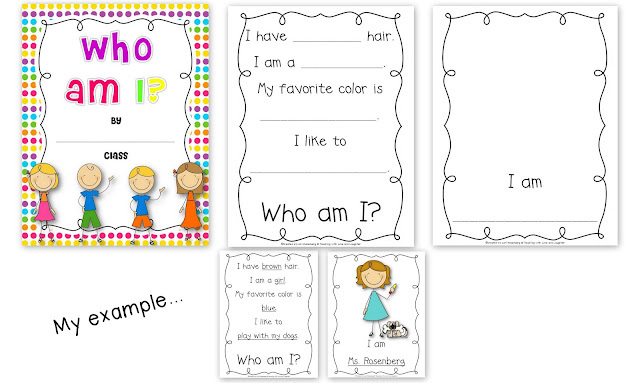 Another class book that I do during the first week or two of school, is Who Am I? I got this idea from one of my favorite blogs, Chalk Talk. I talked with the author of Chalk Talk, April, and she gave me permission to give away my version of the book. You can find April's original idea if you click on the image below. When I saw April's idea last year, I knew I had to make this book with my kindergarten class. It came out really cute and was read over and over again. When you put the children's work in page protectors, make sure to put their self portrait in the same page protector as their writing, back to back. That way, when they are reading it, first they read the writing, then they guess who it may be, then they turn the page to confirm. I always put my class books in 1/2 inch binders and stick the pretty cover in the clear view front pocket. If you would like to make this class book, just click on the image below. I wish I had some pictures to share with you, but I made this book before I started blogging and it's packed away at school. You can see some cute pictures on April's blog, though. Thanks, April, for allowing me to share this book with everyone! I just want to update everyone on some giveaways that I am participating in. 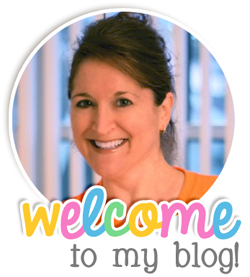 Please stop by Heather's blog. 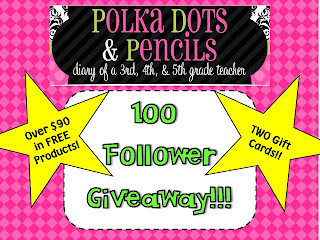 She is celebrating 100+ followers by giving away tons of fabulous products. Next, make sure to visit Lacie's blog. 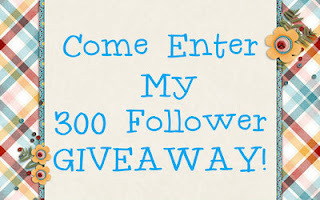 Although her giveaway started as a 100+ follower celebration, she is now way past 200 followers! Next, stop by Buzz, Buzz, Buzz. 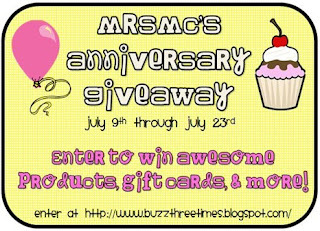 She is having a Mega Anniversary giveaway that is not to be missed! 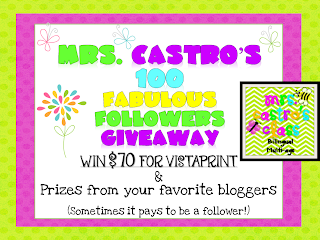 Laura, from Mrs. Castro's Class, is having an enormous giveaway. There will actually be six different winners! 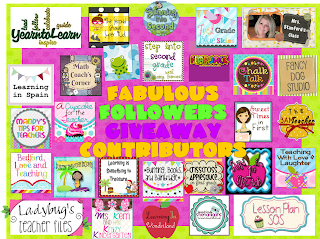 Please visit Marie, over at The Hands-On Teacher, to enter her amazing giveaway, too! 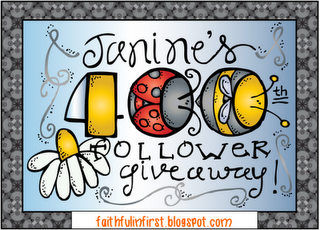 Finally, Janine is having a Blockbuster Giveaway! You won't believe the size and magnitude of this one! I have a similar book but you lift a tab to see who the student is. I think this might be cuter! I love books that personalize our classes! I love classroom books and so do kids. They become their favorites to read. Thanks for a new one. I love your version of the Who Am I Class Book. I love your rules class book idea too. I can't wait to use it when school starts. Your Who Am I? book is so cute! I just emailed my friend who teaches kindergarten the link to this blog post. The Who Am I? book is great! Thank you SO much for helping me with my giveaway. I can't believe how generous you have been with all of us Newbies. You are awesome! I can't wait to use your "Who Am I" Book!! So great! I know my kids will love reading it all year long. Thanks so much for sharing. I love that Who Am I? book. I love your class book...very cute and the kids will love it! I tried to fix it again, am I still a noreply blogger? Here's my email just in case. Hi, I just became your newest follower. I love the Who Am I book. I teach in Coral Springs too. If you are not set to no-reply blogger, I have already personally thanked you for your kinds words. If you are still a no reply blogger, please read my last post so you can fix your settings. I do so appreciate all the kind words. @Sharon, what a small world. Email me so we can exchange particulars. Thanks!